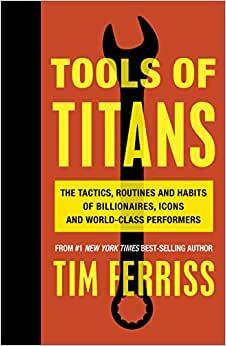 #1 New York Times Bestseller The latest groundbreaking tome from Tim Ferriss, the best-selling author of The 4-Hour Workweek. For most of my guests, it's the first time they've agreed to a two-to-three-hour interview, and the show is on the cusp of passing 100 million downloads. Start reading Tools of Titans on your Kindle in under a minute. Tim Ferriss is one of Fast Company's "Most Innovative Business People" and one of Forbes's "Names You Need to Know." He is an early-stage tech investor/advisor (Uber, Facebook, Alibaba, and more) and the author of three #1 New York Times and Wall Street Journal bestsellers- The 4-Hour Workweek, The 4-Hour Body, and The 4-Hour Chef. The Observer and other media have called Tim "the Oprah of audio" due to the influence of his 100M-plus-download podcast, The Tim Ferriss Show. This book is like an encyclopedia of knowledge that I would hand down to my child. I highlighted no less than 50 books I now consider "must reads" and took down more quotes of wisdom, insight and brilliance than I think I'll ever be able to memorize. Most notably, Tim shares a person passage on suicide. In a world of tech start-ups, billionaires, world class performers and chess prodigies (to paraphrase) this raw, humble and touching part of the book brought me to tears. I've already recommended this book to the smartest 10 people I know and would definitely consider myself 'one of 1,000 true fans' having read the whole book off my iPhone in 4 days, while accomplishing 4 straight days of meditation for the first time in my life, starting the 5 Minute Journal, religiously making my bed the tidiest in the house, doing my fair share of Wim Hof breathing in the freezing shower of a morning and star gazing therapy before bed at night. You're changing lives Tim and this book is a triumph! I so love this stuff! This is a collection of Tim’s tenacious pursuit of being better in the form of a couple hundred distilled interviews. You can spend the three months listening to all the podcasts and making notes or get this. I can see myself coming back to this so many times. Not every topic is relevant to me now but I know I will return to many when I need and go from there. When I began tools of titans I started to feel it may be of little use. I had read tim's previous books and listened to a good percentage of his podcasts. My initial feeling couldn't have been more wrong, this is a great read full of fantastic insight that I recommend for anyone wanting to be better at anything. 5.0 out of 5 starsFantastic and unique book, but go with hard copy! Brilliant book, but I recommend hard copy. I ended up buying one as well so I can easily flip in between interviewees across the book. I also like to highly and make notes in this book, hence another reason hardcopy is preferable. Great book, I actually didn’t have the highest of hopes, thought it might be an interesting Sunday afternoon light read but was truly engrossed and have gone back to many sections over and over. It is inspirational in many ways and I appreciated the broad spectrum of people interviewed, well worth the purchase. I would recommend this book to anyone who appreciates reflecting on their own life based on the words of wisdom of others. What I personally took from this book was the need to maintain presence in all aspects of life to live a full life (and not one full of thoughts). Interesting book that I will definitely re read to absorb as much as possible. Some sections are dense. But it is designed to be skipped if you're not particularly interested in gymnastics or what ever topic. I love the podcasts but haven't been able to listen to all of them. This book distils all the knowledge and best parts in one easy to read format. It is a great companion reminder after listening to the podcast. Thanks Tim. Great job for drawing out all the inspiration from these amazing people.